Why I chose this example? In my talk at dotSwift 2017 I start with generic overview of some of the RxSwift basics and move to three complete code examples. In three posts I’ll post the sample code and comment shortly why I chose to highlight these exact examples. Let’s start with number one. The first example in the talk is a simple single-screen application that allows the user to enter a repository name (or part of it) and search GitHub for matching results. One of the main points I make in my talk is that Rx and RxSwift in particular solves in big part the pains of asynchronous programming. Cocoa and the iOS SDK offers us a lot of different tools to battle asynchronos flows but there is no standard and we end up using many different (if not all) of these APIs. It’s not rare in complex app to use all of NotificationCenter, Grand Central Dispatch, closures, delegates, and more. 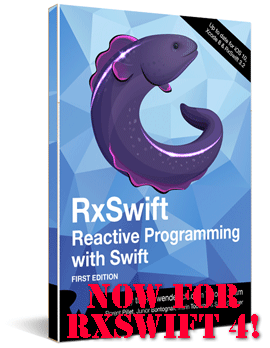 RxSwift solves this by offering a single standard protocol for asynchronous communication between any classes in the app - Observable. And this is what I wanted to demonstrate with the first example - how a rather diverse workflow that would usually be very complex, involving delegates and closures, becomes very simple to read, and sequential to write. The issue with rx.text is that it emits String? since the field value is nil when there’s no text inside (Thanks, Obama). Luckily there’s an operator called orEmpty, which converts an optional nil to unwrapped default value. So for String? it returns "" (a non-optional empty string). This maps the observable to Observable<String>. Neat! var apiUrl = URLComponents(string: "https://api.github.com/search/repositories")! We build a URL and a URLRequest, which is ready to be sent to GitHub’s server. This map converts the observable to an Observable<URLRequest>. Using flatMap on the items collection will discard any objects that didn’t convert propertly to Repo objects. This final map converts the reponse to an Observable<[Repo]>. let cell = tableView.dequeueReusableCell(withIdentifier: "Cell")! The operator binds the list of Repo objects to the table’s rx.items. In the closure parameter you provide the code to deque and configure cells for the table. If you want more advanced table binding (e.g. using animations, sections, and more) check out the RxDataSources library, which provides many different choices. If you’re working with Realm objects, there is a special library that allows you to use row animations and more automatically called RxRealmDataSources. 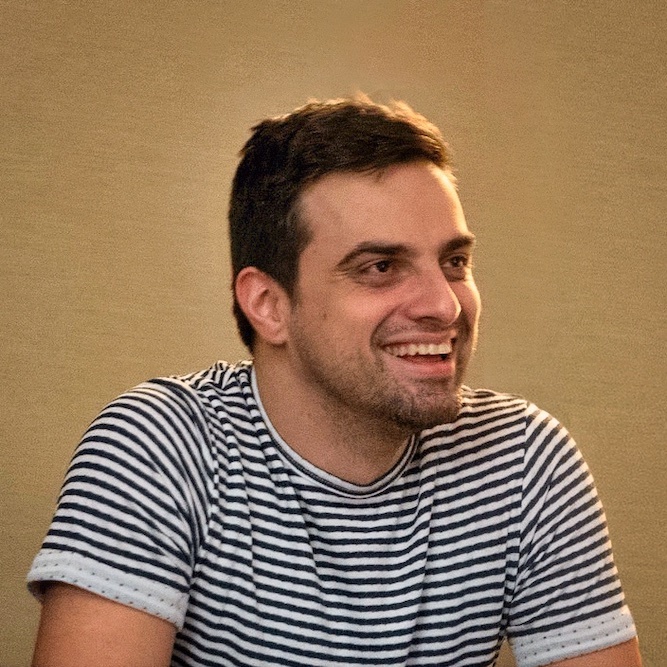 let apiUrl = URL(string: "https://api.github.com/search/repositories?q=" + query)! In a full-blown app you will have a networking layer, data layer, etc. You are likely to split this long chain of operators in two or three parts depending on what architecture you use. In any case, following the Cocoa patterns you will have one delegate for the text field, one data source for the table, and URLSession will work with an asynchronous callback closure. The code is split into chunks, and you as the developer need to always keep in mind the sequence in which these methods will get called as to not corrupt the app state. 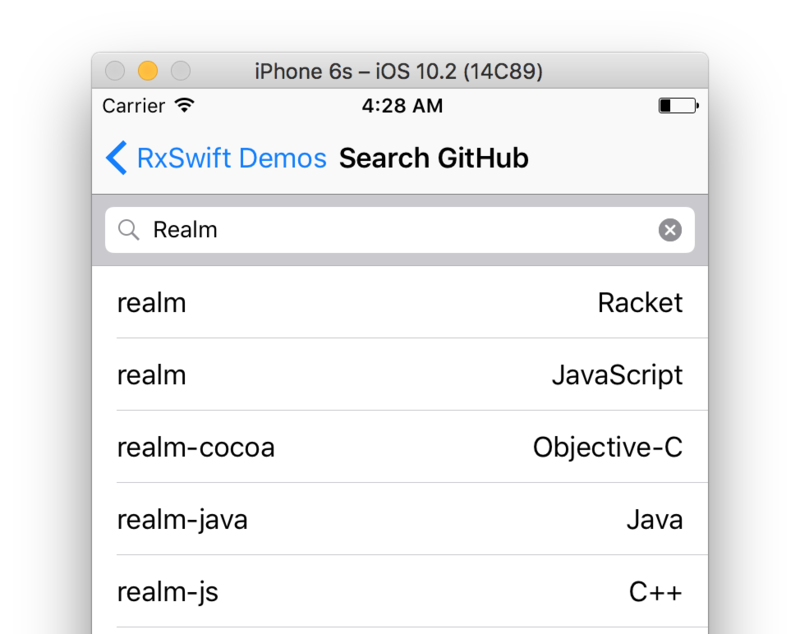 With RxSwift the code is easier to understand because it reads sequentially. Further it’s very easy to argue about the order in which code is executed even if it’s being executed asynchronously.